Nick went to the butcher's to buy some ham. Sit down and rest your hams on a chair for a while. I did want to see that play, but I've just read who the lead actor is. He's a terrible old ham; I don't think I'll bother going. There is a wide network of radio hams. That actress was hamming terribly all the way through the movie; I don't know how she got the part. Ham also used to be the word for a plot of pasture land. It is still used in some dialects in southern England and you may also sometimes find it as part of the name of a particular piece of ground. 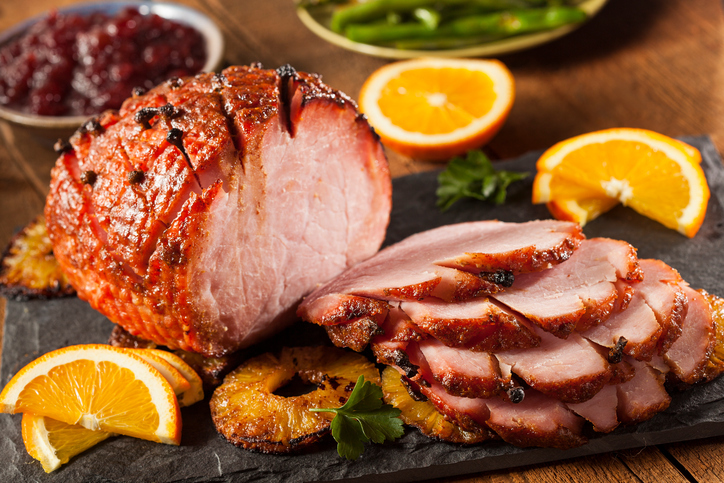 Ham, meaning ‘thigh of a hog,’ especially salted, cured or smoke-dried, dates back to before the year 1000. The Old English hamm (hamme in Middle English) originally meant ‘part of the human leg behind the knee,’ and ‘the hock of a four-legged animal.’ Its sense extended from here to the one we know today in the early 17th century, and eventually lost the older meanings, though it has been used figuratively to refer to parts of the human body for centuries. It can be traced back to the Proto-Germanic root hamma– and the Proto-Indo-European kone-mo– (shin bone). It is related to the Old Norse höm, the Middle Low German, the Middle Dutch hamme and the Old High German hamma, as well as the Greek kné̄mē (calf of the leg) and the Old Irish cnáim (bone). Ham-handed, meaning ‘clumsy,’ dates back to the late 19th century, while ham-fisted to the early 20th century. Ham, meaning ‘an inferior or overacting performer’ dates back to the late 19th century, and is short for hamfatter, a reference to the minstrel song “The Hamfat Man” and the quality of acting in minstrel shows in general. In this sense, the verb comes from the noun, and dates back to the 1930s.